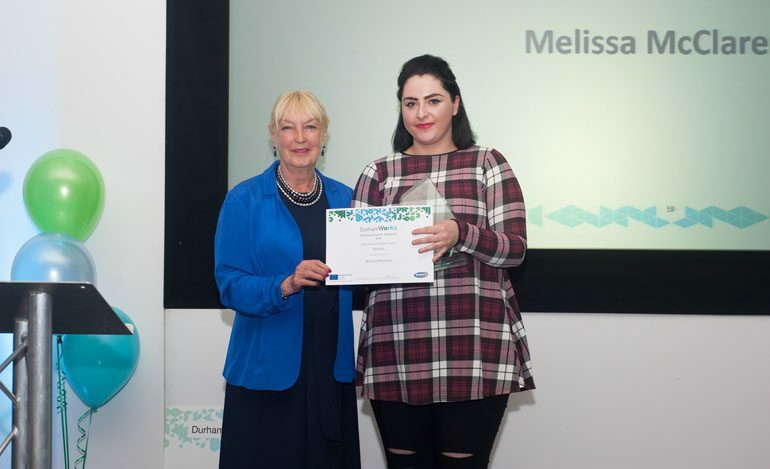 Young people supported into employment, training and education as part of the DurhamWorks programme have been recognised at an awards ceremony celebrating their efforts. The DurhamWorks Achievement Awards, which took place at Ramside Hall, saw six prizes handed out to young people as well as the employers who have supported them over the last 12 months. DurhamWorks is a partnership programme led by Durham County Council and funded by the EU social fund. It is supported by the Youth Employment Initiative and aims to have supported nearly 5,000 young people between 16 and 24 to be ‘work ready’ by July 2018. Cllr Olwyn Gunn, Cabinet member for children and young people, said: “The awards event was a fabulous evening and it was a real privilege to meet these incredible young people and hear their stories. The scheme works with a number of partners to help young people not in employment, education or training to develop their existing skills, identify new ones and help them into a range of training, job and education opportunities.